did you know? Since the early 1990 many industries have begun to substitute products made from lead with non-toxic alternatives made from Bismuth. 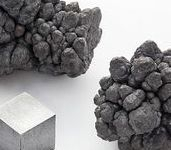 “Lead poisoning (also known as plumbism, colica pictorum, saturnism, Devon colic, or painter's colic) is a type of metal poisoning and a medical condition in humans and other vertebrates caused by increased levels of the heavy metal lead in the body. “With the Industrial Revolution in the 19th century, lead poisoning became common in the work setting. The introduction of lead paint for residential use in the 19th century increased childhood exposure to lead; for millennia before this, most lead exposure had been occupational. 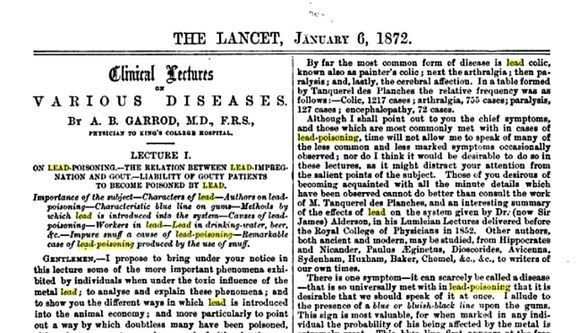 An important step in the understanding of childhood lead poisoning occurred when toxicity in children from lead paint was recognized in Australia in 1897. "Lead poisoning is an environmental disease, ... Lead is one of the best-studied toxic substances, and as a result we know more about the adverse health effects of lead than virtually any other chemical. The health problems caused by lead have been well documented over a wide range of exposures on every continent. ... We clearly know how it gets into the body and the harm it causes once it is ingested, and most importantly, how to prevent it! " "Lead’s toxicity was recognized and recorded as early as 2000 BC and the widespread use of leadhas been a cause of endemic chronic plumbism in several societies throughout history. The Greek philosopher Nikander of Colophon in 250 BC reported on the colic and anemia resulting from lead poisoning. Hippocrates related gout to the food and wine, though the association between gout and lead poisoning was not recognized during this period ( 450-380 BC). Later during the Roman period, gout was prevalent among the upper classes of Roman society and is believed to be a result of the enormous lead intake. " "There were recordings of Roman wine being banned by German tribes because of the sickness which resulted. Surprisingly, many doctors of that period prescribed preparations of mercury or litharge itself to cure colic! " Poorly glazed pottery used to store beers and wines resulted in chronic colic outbreaks in Germany when the lead leached out into the brew. Even today, some wine seals are made of lead and some leaded crystal decanters can leach lead into the liquor. One of America’ s first public health laws was to ban the use of leaded coils due to the health problems it caused to people who drank the spirits. In colonial America, the Massachusetts Bay Colony banned lead from being added to wine and cider. leaded (in 1825, 21 million liters of port was consumed in England). Poorly glazed pottery used to store beers and wines resulted in chronic colic outbreaks in Germany when the lead leached out into the brew. Even today, some wine seals are made of lead and some leaded crystal decanters can leach lead into the liquor." "In the eighteenth, nineteenth, and twentieth centuries the worst outbreaks of lead poisoning of adults were occupational in origin. It became common knowledge that to work in an industry where you handled lead was certain to make you sick or worse. These workers absorbed lead from inhalation of fine lead dust or fumes, contamination of food eaten at the workplace, or by absorption through the skin. " "Charles Dickens describes in his essay "Star of the East" the horrible effects of lead poisoning on women who work in London’s infamous white lead mills, " her brain is coming out her ear and it hurts her dreadful...". "Benjamin Franklin in 1763 wrote about the "dry gripes" (colic) and "dangles" (wrist drop) which affected tinkers, painters, and typesetters." “Lead’s hazards to the reproductive process have been known for at least a century. British factory inspectors at the turn of the twentieth century noted that women who were exposed to lead through working in the cottage ceramic industry tended to be barren and that children who were born to those women were often short-lived. In most western countries during the 1930’s through the 1970’s, awareness among health workers was associated with more lead poisoning cases being reported, and laws protecting workers were being enacted." "Today, occupational exposure to lead remains a big problem in developing countries. Occupational lead exposure is likely unregulated in these countries with little monitoring of poisoning being done. What has become a grow ing concern among health officials is the prevalence of home-based cottage industries in these countries. These cottage industries are located in the where large numbers of people live, especially children. They are of particular concern since these non-regulated businesses deliver the lead right into the homes or yards where children live or play. where children live or play." "Alice Hamilton of Harvard Medical School, a pioneer in the study of occupational diseases and a recognized expert in lead poisoning, spoke briefly at the hearings to review TEL: " I would like to emphasize one or two points that have been brought out. One is the fact that lead is a slow and cumulative poison and that it does not usually produce striking symptoms that are easily recognized." "Lead makes the mind give way."